I found another chapter on portiéres (room door curtains), and, as usual, I am sharing it. Who knows if anyone is interested in this besides me, but at least it makes it convenient for me to access the information. LOL This is a word-for-word transcription of the chapter. 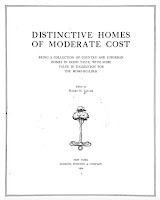 The book is called Distinctive Homes of Moderate Cost and was written by Henry H. Saylor, ed. and published in 1910. If you'd like to see the original text, you can download it here at Internet Archive. There seems to be a sad lack of originality in the hangings one sees today. It is nearly always the same old velour or the same old rep, guiltless of any relieving color in the way of an edging or an appliqué design. Why not get some distinction into these important elements of home decoration? After all, the portières in a home are just as important factors contributing to the success or failure of the whole as are the wall covering or rugs. Because they occupy less area than the things we put upon the walls or floors, they are only too frequently passed over without their due of consideration. Their importance and value in carrying out a comprehensive scheme of decoration in color and design is something that may well be reckoned with. It should be understood at the outset that in the short space allotted to this section it is quite impossible to cover the whole subject of portières. It goes without saying that the designs illustrated here would be utterly incongruous in an Empire drawing-room, for example. In rooms, also, in which other French or Georgian period styles have been carried out in the architectural details and in the furniture, the hangings should, as a matter of course, be along the same lines. There are many beautiful fabrics from which to choose portières for rooms furnished in period styles—and at prices to suit everyone; velours, linen, upholsterers’ velvets, self-crinkled tapestries, brocades, corded silks, goat's hair, Armures, figured tapestries—each of which may be found the one suitable material for a certain purpose. 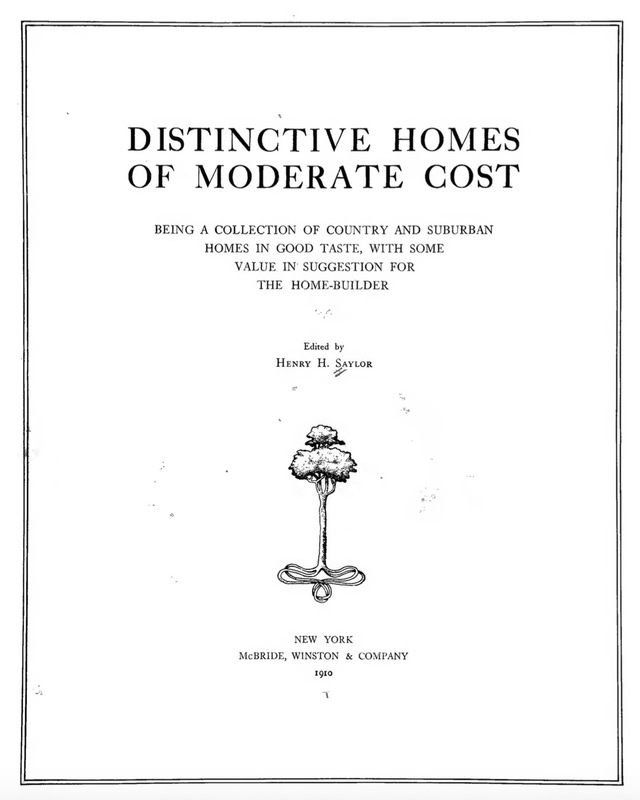 It is for the everyday American living-room, den, library, or hall, however, that the designs here shown would solve the problem of hangings—rooms where no period style has been permitted to assume its jealous reign, but where the furnishings are of the simple, unassuming character that marks modern American work of the best type. In such a room the note of individuality and distinction that any of these designs strike will be a welcome and unobstrusive one. The portières that are described and illustrated here with all are made from inexpensive materials and decorated with very simply executed designs. Patterns for the work can easily be made by anyone possessing only a very slight knowledge of drawing. The embroidery requires acquaintance but with few easy stitches. Of the portières illustrated at the bottom of page 95, the first is made from a material called Arras cloth, in color a light golden-brown. Jute and linen are used in the composition of this fabric, resulting in a weave that has an unusually pleasing variety of texture It is imported material and costs eighty-five cents a yard. To break the monotony and to give the hanging a distinctive character, the conventional tulip design in appliqué and made from linen of a burnt-orange color. Inexpensive linens may be used for this purpose with good effect, but in some of the more costly kinds there are to be found changeable tones that are really worth the difference in price. 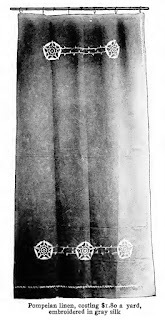 The conventional leaves at the bottom are of pale grey-green linen, and the stem joining the two pieces of appliqué is indicated by lines of couching. The second illustration at the bottom of this page shows a portière of heavy linen, Pompeian-red in color, and costing $1.80 a yard. The design in this case, which is not so startling perhaps in its character, is embroidered in gray silk. It will be noticed that there is a feather-stitch edging along the inside edge and across- the bottom at the top of the hem. Russian crash is the material that has been used in making the third hanging illustrated at the bottom of this page. Since crash comes in rather narrow widths, two were required for the example shown in the illustration. It must be borne in mind that it is always essential to plan so as to get a whole set of portières from one piece of crash. The reason for this is that the pieces, containing several yards each, vary considerably in color and texture. The fabric is not at all expensive, probably for the reason that it is woven by Russian peasants at hand looms in their huts. It shows a far greater variety of weave and color, for this reason, than any machine-made product possibly could. A conventionalized pattern, worked out in a series of squares and lines, is used for the appliqué. Pieces of linen in rose and green are used, and the embroidery is done pale green worsted. Of the two examples illustrated on page 94, the first one has the conventionalized trees worked in the so-called "peasant embroidery.” They are in appliqué of apple-green velvet or velvetine, with couching of embroidery cotton, pale gray-green in color. The fabric of the portière shows a similar color in a deeper tone. The other illustration at the bottom of page 94 is made of plain rep, costing fifty-five cents a yard. It is instructive to see how much more interesting it has been made merely by the addition of the five spots of decoration. The material is a cream yellow and the deep hem is couched on top with worsted in a soft pastel shade of blue, the line of couching extending around the inner edge of the portière. For the decoration, discs of appliqué are used, stiffened with buckram, and embroidered in blue worsted. These are tacked to the hanging after the work on them in completed. In this example the discs measure six and three-fourths inches by eight inches. The buckram is cut out in the desired shape and covered with a coarse brown linen, after which it is buttonholed around the edge with the heavy worsted. In the center of the discs, the pattern is also in blue worsted. It may readily be imagined that the cream yellow contrasts pleasingly with the blue spots of decoration, a combination which is further improved by the glimpses one gets of the brown linen. It should be remembered of course that much of the success of portières of this kind depends upon the proper placing of these bits of appliqué. The best way to determine how they should be put on is to lay the portière out upon the floor and, with markers, try various combinations.